When booting up the system for the first time you will be presented with an login screen on the console. 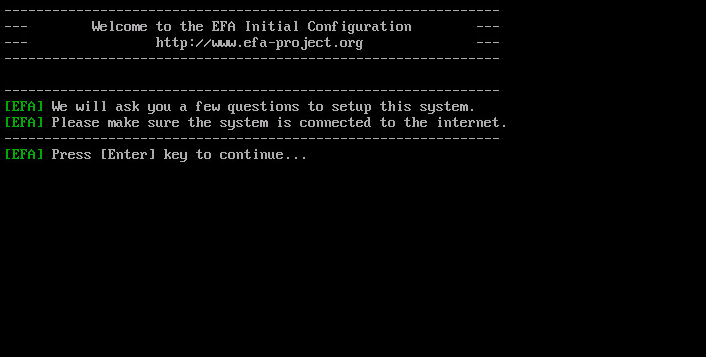 When you login with the shown username and password the system will automatically start the EFA-Init setup program. Hostname	 The hostname of the machine, this should be a single word and is used to access the system. Domainname The domain to which this machine belongs to, together with the hostname this will make the FQDN to access the server. postmasteremail The email address of the postmaster, this user will receive various postfix related mails. IP address The IP for your spam filter, if an internal range is used make sure you configure the appropriate NAT port forwards. Netmask The netmask for your spam filter. Default Gateway The default gateway. Primary DNS The primary DNS server to be used for lookups. Secondary DNS The secondary DNS server to be used for lookups. Local User The local admin user name, for example your normal login name that you use. This is used to logon to the system and webinterface. Local User password The password for your local user. 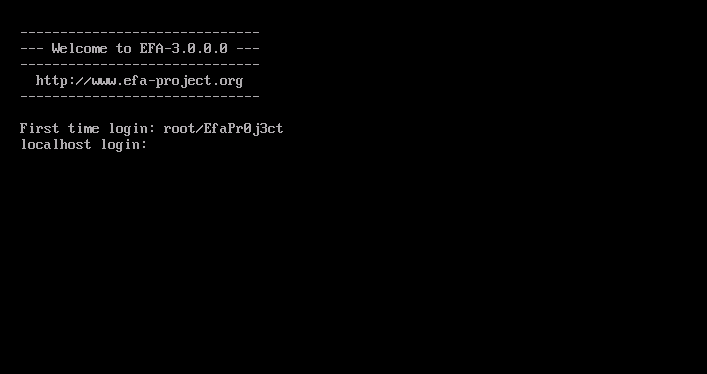 Root password The password for root, this should be a strong password and stored somewhere save. VMware tools If you run VMware you get the option to install Open VM Tools. If you somehow require the official VMware tools then say No here and install the VMware tools manually later on. UTC Time If you host is set to the UTC timezone select Yes here. Timezone Select the timezone you are located in by typing in the appropriate number. Keyboard layout Select the keyboard layout to use for the system. IANA Code The IANA code from the country you are in, this is used to determine which mirror to use to download updates from. If you don't know your IANA code please find your country at this list. 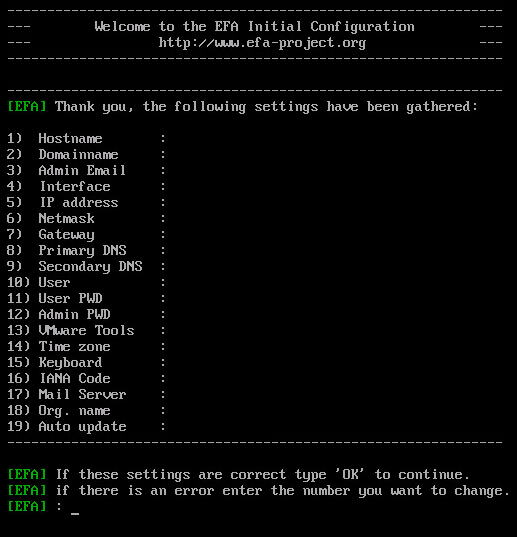 Your mailserver The IP of hostname of your mailserver to which E.F.A. will forward all mail if believed to be clean. Your organization name	 The name of your organization, this is used in the email headers for example. If you use E.F.A. personally just make something up. Auto Updates Auto update the system to newer E.F.A. versions when they are available by default this is DISABLED. Note that this might not be allowed by your company update policy\, if you keep the Auto Update setting disabled you will receive an e-mail on the Adminemail address that an update is available. When all questions are answered you will be presented with an overview of your answers, if you made a mistake or want to change any of the settings just type in the number of the option you want to change. If all settings are correct type OK to start the configuration. When the configuration is finished the system will reboot and will be ready to go.